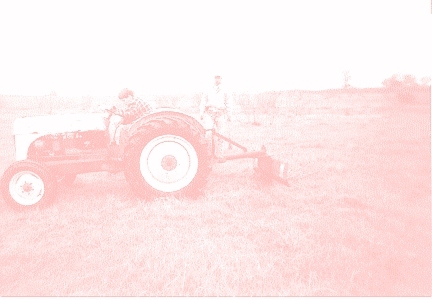 This is a photo of my 1950 Ford 8N tractor, purchased in January, 1998. My first driving experience was on my grandfather's 1952 8N, so this was a special purchase for me. This photo was taken in March 1998. 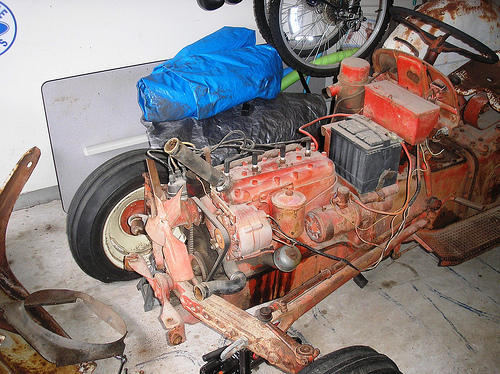 After having this now-61-yr-old tractor in my garage for 6+ years, I have finally begun what I thought would be a simple repair and paint restoration. I'll post more information (and a link to pics) about once a month. I have no timeline for completion, but I do hope to turn a wrench every weekend. Here are this month's photos. You can see them all at my Flickr page. 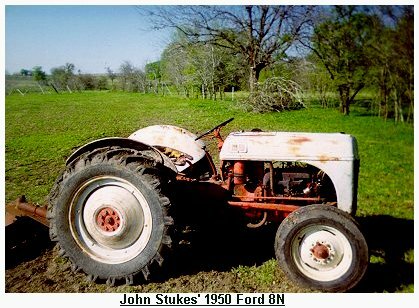 If you have a Ford N-series tractor, you can identify it's year from this list of serial numbers. Here are some more 8N photos. I will post more photos of the 8N as they are available. Also, please note that most of the work on the Big S Ranch was being done by this old tractor until a few years ago. I hope to restore it to working condition again. I bought this tractor in January 1998. Initially, it ran like a dream. I've had some problems with the carb, with points and plugs, but nothing too serious. About a year ago, I was mowing some high weeds which got tangled in the wiring from the alternator to the distributor and ripped some wires loose. Since this is a 12volt conversion, I don't have a good wiring diagram. I have not been able to reconnect the wiring myself, and have not been able to get "professional" assistance. So it sits. I had very high hopes for restoring this tractor to good working condition (paint, etc), and it still has no serious mechanical issues. However, since it has sat so long, the fuel tank is gummed up, points & plugs have deteriorated, etc. I think my best bet is to load it on a trailer and take it to a mechanic. Hopefully, we can accomplish this by summer. The other problems I've noticed are (a) leaky hydraulics - With PTO off, the three-point goes from high to low in about 25 minutes. (b) non-functioning draft control - in constant draft control, the three-point stays down. Adjustments should fix. (c) Right rear brake drags a bit. The hood is a little rusty. The grill is ugly (wired in place). No decorative radiator cap. No FORD emblem on the front. If you have any of these for sale, let me know!